Please send me a Facebook message stating your delivery address. Thanks to everyone who participated! Benefit Cosmetics is one of my favorite makeup brands. Apart from their fun packaging, their products are amazing! My favorite products (you must try them!) are Benetint, Hello Flawless foundation and Fine One One. I've also reviewed other products- Porefessional, Bella Bamba and their latest launch Fake Up. 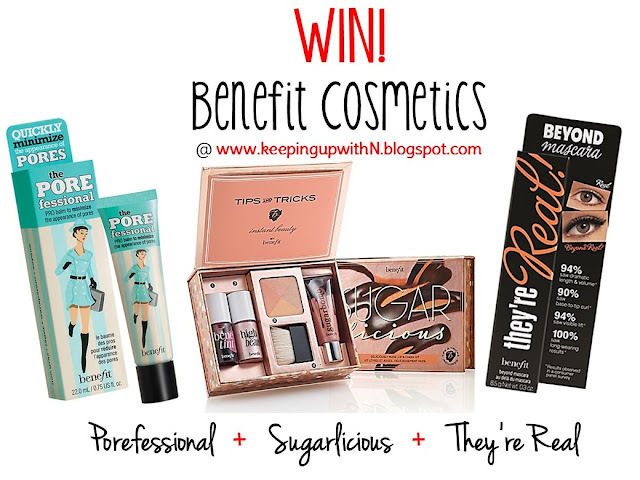 And because I LOVE it so much, I've partnered with the awesome people at Benefit Cosmetics to give away amazing goodies! There will be 5 winners in total from Twitter and Facebook. 3) Post your answer to this question in the comments section below: When you were in school, what was your biggest make-up faux pas? Once your comments are approved, they will be published. Please do not post your comments multiple times. Thank you. When you were in school, what was your biggest make-up faux pas? I remmember when i was 2nd standard, i take my mom lipstick and put in my lips, when my mom saw ..she was very angry. ,.haha still remember that time,when I was in a competition(group competition) I actually don't know how to put a blush on, and I just put it on my cheek a circle pattern just like on the doll's face..imagine that.. I remember my first make up faux ..i do not know how to apply liner. I used only the lipstick for lips , cheeks & eye shades ( with one stroke & no blendings ) imagine a clown !! I think during the Annual day Ceremony where i learnt for the 1st time about "foundation" and applied it without knowing what was the right amount. So when i went to perform my Dance, i looked more of the ghost with scanty makeup and bright pink lipstick to add the effects....Hahaha Biggest Fashion faux-pas. I think my biggest faux pas would be not to use waterproof eyeliner when I first started using makeup. It would be sad and funny when I'd rub my eyes and begin to look like a panda. But today, I've learned my lesson and panda eyes no more. Answer: Lining ONLY the bottom lashline/waterline. By doing this it made my eyes look so tired. My eyes looked smaller and more narrower than they actually are. This wasn't flattering at all. When I was in grade school (grade 2, imagine how young), I used creep paper (red color) as for my lipstick. while in school my biggest make up faux pas would be using dark lipstick during school occasions which would make me look very scary and darken my complexion. I NEVER WASHED MY MAKEUP OFF!! I always went to bed with it on. I never had acne or facial problems, WHEN I WAS YOUNGER, so i took advantage of that..big mistake, now my face is sensitive in my mid 20's! But that was my FAUX-PAS & believe me, wish i knew better! During school times I was always fascinated by aunts make up which was imported. Once when she was not around I picked up couple of her makeup items (lipstick, blush & eye shadows) & took them to my school to use them & show off my friends. someone stole the eye shadow kit from my bag, only for me to be punished by my aunt, who wouldn't talk to me for years. In school my biggest make-up faux pas was over plucking my eye brows and having to use my mum's eye liner pencil to try and make them look normal, until the hair brows grew back. It was so very embarrassing! the biggest makeup faux was when i took my moms lipstick from her beauty box and came to school and applied to all my friends and I was punished for this act by my teacher. I was a fan of the dark lip liner, light lipstick trend. when i was in school ,there is a very big memory attached to the word make up as i cant forget tat day throughout my life as it a was a really a funny day and rather a day which taught me the correct application of make up. it was like i was in 9th standard and hardly i apply any make up.So just for a change i thought to impress all,so i applied powder and foundation cream even. But alas,as soon as i entered the class all the batch mates specially the boys started making fun of me telling i have applied 6 inch paint on my face.tat day i really weird appearance and sadness filled in my heart.that taught me a lesson on how to apply the correct make up suitable for my face.Now i feel i should thank my frenz for it. it happened when i was in 9th standard in school,the day i will never forget in my life.It all happened like i thought of applying make up and going to school farewell function which we were giving for the 10th standard students.it was the first time i am applying make up.firstly i applied foundation and then over it cream.i didnt know tat the foundation i applied was too different a contrast color for my skin.when i entered the school hall, all started glaring at me with all their eyes and even started making fun of me saying i have applied 6 inch paint and varnish on my face.i felt very sad and gloomy were a few days after tat.But tat taught me the value of correct application of make up.tanx to my frenz for all tat.jus cherish those memories of my life. when i was in 9th grade, i bought a mascara(not waterproof) and applied.. am about to enter the school gate then suddenly the rain poured i accidentally wiped off my eyes & ola! my mascara scattered all over my face, i forgot that i was wearing a non waterproof mascara & i entered the classroom & my classmates was terribly laughing at me... it was so embarrassing! wheww! "When you were in school, what was your biggest make-up faux pas?" I didn't actually start wearing make-up until Uni! My biggest faux pas then was the black eyeliner on the inside of the eye lid. It made my eyes look smaller and it always smudged lol. i love Benefit Cosmetics and I hope I am chosen as the winner. My biggest makeup mistake in school was putting face powder on my face and not blending it properly. Once a school guy commented on that and I was so ashamed that I got put off by makeup for some time. Now I always research any makeup item and how to apply it before actually applying it. I love benefit Cosmetics and I hope that I get chosen as a winner. My biggest makeup mistake in school was that I put on face powder but did not blend it well. It was a school party and a guy commented on it. After that I was so ashamed that I got put off makeup for some time. Now I always research a product and how to apply it before actually purchasing and using it. my biggest makeup faux pas was on my first date... apart from wanting to look good i was so nervous that i used the pencil eyeliner as my lipliner and used moms lipstick as eyeshadow and blush... i think by the time i met my date i had licked the lipstick off my lips out of nervousness. There was this one time when I was in 8th grade, I used my mommy's waterproof mascara few hours before going to the school. I didn't recognize it was waterproof & I tried taking it off as soon I realized that! But it was too late; My bus was down stairs already! At class my teacher asked me If I wore mascara, as soon as she asked that question I told myself that 'this day isn't gonna end well." But it did! It did end well! I told my teacher that I put some water in my eyes because I was too sleepy, & then she minded her own business the whole day! LOL! The makeup faux paus was putting on liquid foundation. Oh my god my friends I looked like we put white paint on our faces. My biggest fashion faux pas when I was in school was my insistent use of liquid foundation that I never got to match my skin tone. I was either white or orange for many-a-days in my younger years! I put nail polish on my lips once thinking it was a lip gloss..Lol! I stole moms make up for a function when i was in 5th grade , a compact that was two shades lighter , a red lipstick as a eye shadow and lip smear ended up looking like a clown lol. Still makes me laugh when i think of it , people cudnt take their eyes off me. I remember in the school before there is like beauty pageant then I'm one of the contestant,I need to put make up then I took my mother's make up I put for myself,I don't know how to use it I just apply then in then end it was disaster very red lipstick,the blush on is not the same and the eyeliner was very black,I didn't win...after the contest they took photo for us and I see myself in the photo it was very bad make up that's why I didn't win....LOL! Applying so much kohl under my eyes that i would end up looking like a raccoon in an hours time! Schooling days are awesome for me, I am using only one mosturising cream daily and Kajal. And for makeup :) nothing to put on my face. For some occasions marriage or party only use lipstick and Kajal it's only makeup for me. That's why today also i am using only lip gloss or lipstick. I have fear after apply foundation or any makeup kit i am looking ugly :(.. Wish i can get Benefit Cosmetics goodies, i know products are amazing which give me new look. I used to be an avid user of lip gloss and wouldnt wanna go to school without eye kajal. My biggest makeup faux was at school age that time i dont know the importance of foundation in makeup and i apply a really light colour foundation that doesnt match with my complexion lolz and with really black eyes wearing kajal on it and i looked like a ADAM'S FAMILY CARTOON character.now i remember and laugh on me ..
Answer: Putting eye liner specially aound the waterline. i used too much pencil eye of a bad quality under my eyes and it all got under my eyes and i looked like an emo! when i was in school i put too much eye pencil under my eye of bad quality and it all got under my eye in about 5 mins and i looked like an emo ! I remember I used to Carry my Mother's Makeup to School With me all the Time Without her Knowing It !!! I was Not Properly Aware Of Where to Apply What neither Do my Friends .... Just Knwe About lipstick or Lipgloss Which my Mom used to PUT Everyday Or the Facepowder ..... I carried My Mom's Eyeliner that Day which I never saw her Putting Maybe cause she was Applying it Only Occassionally .... I THought it to Be a Lipstick, and Applied it All Over My Lips ... OMG the Way I looked and THe Girls Started Laughing AT ME tremendously ..... Haha this was the Height Of Innocence ! You Wont Believe me But i used to Put Kajal as Lipstick and I used to Love the Black Color On my Lips I DONt know why until i came to Know that it is actually Supposed to apply On Eyes and Not on Lips !! My biggest makeup faux was I always pocket My mom's lipstick and wait until I got to the bathroom at school to put it on? And,I logged countless hours in front of the bathroom mirror experimenting with different colors and ways to draw on eyeliner until it hit on just the right combo. MY MAKEUP FAILS aka ARGH! DONE DONE DONE DONE ANNNNNND DONE! My biggest make-up faux paus in school was heavy foundation, concealer and powder which often lead to a chalky, caked-on appearance. Since the idea was to make my skin look better than it did without makeup. I use to apply my mothers make up when I was in school. Once I applied her blush in no light and it turned out disaster. My biggest faux pas during my school days have to be applying eyeliner & making my eyes look like a raccoon! It had more of a goth look. It took me quite a while to perfect applying liquid eyeliner in thin precise line. But thank god, I have come far along the eyemakeup process!! well... my biggest makeup faux was at school their was a party and i wanted to apply lip stick for the fist so i took one from my friend and i applied it i remember it was brown but i applied it way too much to make my lips look more big so it ended up making me look like a monster heheheh schools days can't forget them. Wearing lip liner darker than the lipstick shade ! My biggest makeup faux pas was when I used to use a kohl liner to line my eyes and I never knew that we could actually do the upper line,always did the lower lash line only but thank god that only lasted for a year or so. I used to apply my mother's mascara on my eyebrows.